Apparently, the main difference between PLE and LMS is the centrality of the LMS. Take the forums, for example, the classical component. You only need one start address and can follow all discussions, in contrast to the blogs where you need to rely on your own selections or other readers’ recommendations. Such a central place quite naturally attracts writers who can expect more readers or more attention, just as the classical Roman forum (marketplace) attracted bargainers. And the forum is convenient for the buyers (readers), too. This does not mean that everybody loves them. Such central structures just exert centripetal forces in a natural way, like downhill grade drift. I, too, find myself posting there sometimes, instead of blogging, although I don’t like them. Like in a real-life marketplace, or bazaar, its crowdedness and noise and bustle and speed, is not for me. John, Roy, and Jenny wrote a paper “Blogs and Forums as Communication and Learning Tools in a MOOC” about this choice of preference (and I had the pleasure to participate in their early discussions). While blogs (and PLEs) are like front porches, a forum (and an LMS) is, in some way, like a marketplace. But a typical LMS shows more than forums-like centrality. It is often a centralistic mindset that reigns here, which embraces a central source of uniform prescriptions, regulations and predeterminations. In the LMS I was recently, the LMS even controlled how single forums postings could be opened in a new windows: only using a predefined button, and the “Back” button was disabled. Comparing this centralism to the above metaphors, the cathedral lends itself to represent this. Advocates of such centralistically controlled environments seem to have a strong faith about the superiority of their way of doing it, or maybe don’t even question their preference. So the choice between PLE and centralistic LMS is also a matter of preference and mindset, just as well as the choice between blogs and central forums. But while the forums choice depends on the styles of the students, the LMS usage is often influenced by an unaware preference of the teacher. This entry was posted in PLENK2010. Bookmark the permalink. I liked the front porch/bazaar images for blogs and forums when we were working on our paper and they seem to work just as well now for PLEs and LMS. This seems not to take sufficient account of the complexity of why people behave/learn in the way they do. I doubt that people (in general) think consciously in terms of superiority or of strong faith. There are so many other variables that can affect whether they choose to participate in an LMS or a PLE – a blog or a forum. Context is so influential in people’s decisions and choices and will influence preference and mindset. Finally I’m finding it hard to imagine how an LMS could not be influenced by the preference of the teacher – aware or unaware. Hi Jenny, sorry that I may have caused a misunderstanding. I did not mean to characterize the LMS as a whole by the bazaar metaphor, just its forum component. And while participants choose between blogs or the forum component, it is the teacher (or some lofty superior) who chooses between the LMS or PLE’s, not just between single usage options of the LMS. 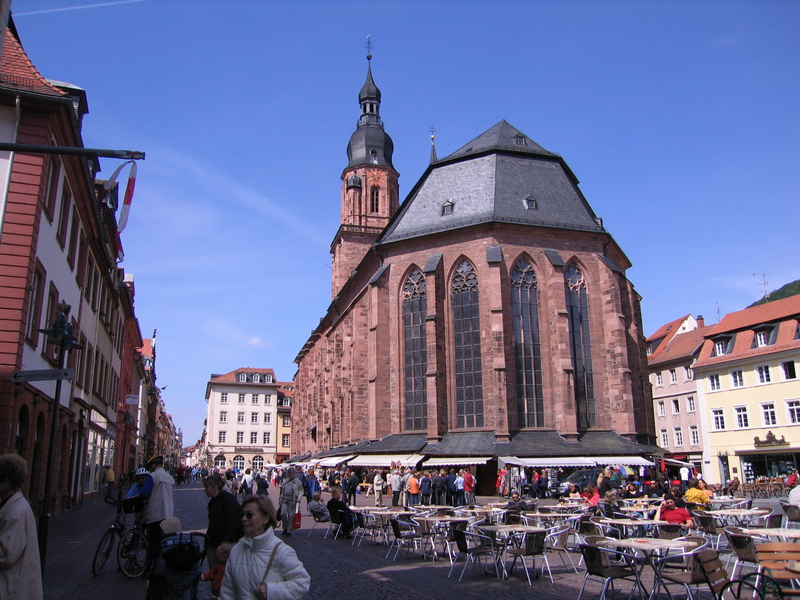 PS: In Heidelberg, bazaar booths are attached to the cathedral !